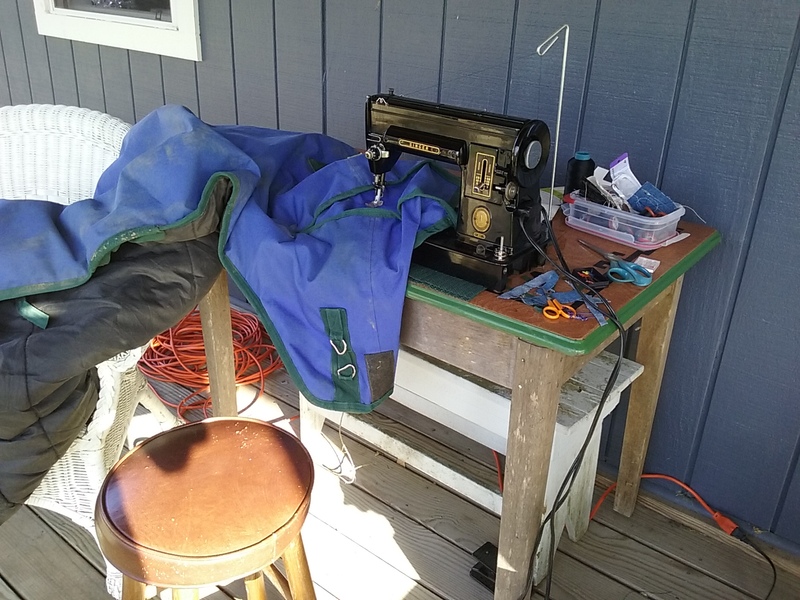 I spent the afternoon sewing on the front porch. Yep, that's a horse blanket. Nope, that is not Belle. She was having a snit fit and had to go for a time out. Pinch-hitting was my 301. Pretty massive repairs on two blankets. Functional, yes. Pretty, no. It was a great day to be outside, plus it probably meant the people driving by were wondering what I was up to! P.S. I also updated the schedule on both the blog and on the website. Greetings! In my last post it may have appeared that I don't use Organ brand needles any more. NOT TRUE!!! I am just more cautious about where I buy. Here is my go-to source: Home Sew. Here are the needles I order, marked with an X. I usually use Size 11 for piecing, and have started using Size 14 when I am doing what little machine quilting I can manage. If you sew knits, the Ballpoints are also excellent. These are excellent needles at an exceptional price. How is your grass growing? My hops vines are already up about 8 inches! In the world of "what-the-? ", this has to be one that I never would have thought of. My mom and I both had trouble with the thread breaking every stitch or two--very frustrating, as you all know. I started doing a bit of research and found that there was a warning on the Organ needle site about--counterfeit needles! This was from back in 2015. Now I was determined to see what the differences were so that I could tell easily--you know, before the thread broke! Test yourself. In the next pictures there are what look like identical packs of needles. Before looking under the picture for the answers, see if you can spot the differences. Differences: The pack on the left has Organ in white letters, the colors on the package are a bit different, the picture of the lady playing the organ is not as distinct, and the trademark symbol is bigger. The writing at the bottom of the packet is also larger on the left. Differences: A bit harder to tell, isn't it? On the package on the left, a different font is used. The word Size is used and the numbers 75/11 are offset. Also notice the logo on the flap--see the differences? Differences: This is the real kicker--the one on the left is just plain foil, poorly folded and crammed into the packet. The one on the right has the official Organ embossed paper wrapper. Here is a close-up of the wrappers. What a glaring difference. But if you didn't know, the wadded wrapper would not be a red flag. Bottom line? The packet on the right is the real Organ brand. I LOVE Organ brand needles. I use them every day. They are a superior needle at a reasonable price. The needle is probably the cheapest item we use for sewing/quilting. But people are reluctant to change them as often as they should because of the cost. Did you know that you should be changing your needle after every 8 hours of sewing? Yes--that could mean a new needle every day--or even twice a day. Don't change it just when it breaks. There is no prize for using one needle for 25 straight years!!!!! A cheap item that can cause a lot of damage to hundreds of dollars worth of fabric in a short time. If you are not sure when you changed it last--CHANGE IT! Is your machine making a lot of noise? Change the needle and see if that helps--it cannot hurt! While you are at it, how are your pins? Are they dull, dinged up, just plain hard to use? Treat yourself to a new box or two and enjoy your quilting time. Life is too short to use inferior tools. Yes, you can consider this as your note of permission for new stuff. The case of the counterfeit needles: CLOSED. It's a hexagon-shaped fabric dish! Just right for small items you keep on your sewing table, bedside table, or even in a travel kit to put threads and snippets in. I know Diane loves horses and teal/turquoise is her favorite color. If you would like to make some of these for yourself or for gifts, visit here for the Pinkadot Quilts tutorial. They are quick and easy to make, all machine made...and fun!